17000 runners came from all over the world to participate in the races of the 30th edition: from Germany, Spain, Portugal, France, Holland, USA, Japan, Venezuela and other countries. To meet runner demand for the 20th anniversary there were marathons on both Saturday (women and over-50 men) and Sunday (men 20-50). The course nestles in the superb Alpine setting of the Eiger, Mönch and Jungfrau mountains, ranging from the idyllic Lake Brienz to the foot of the north face of the Eiger. 6300 runners finished, cheered on by more than 50,000 fans along the course, up to an altitude of 1800m. Tens of thousands of spectators created a thrilling atmosphere along the course leading up to the floodlit centre of Prague. 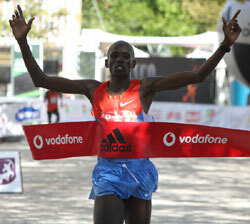 "A great race, I enjoyed it", said the 19 year old winner, Henry Kiplagat. "I had no strategy, I just ran fast and this is how it turned out. Finally I was alone at the front." 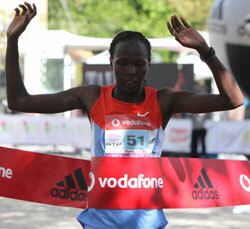 He shook off Adugna Tekele at halfway, and Kiprop Limo also passed the Ethiopian in the latter stages. Patrick Makau was philosophical about his 10th place: "I felt tired. The cobblestones were not good for me. 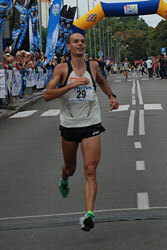 I was watching my every step," he said, mindful of his next Marathon in Frankfurt at the end of October. The attractive small town of Pila, bearing few traces of its past upheavals, hosts an international event with a familial atmosphere. 2500 Polish runners and a sprinkling of international elite athletes contested the race in good conditions (20°C, no wind). The 13th edition had 1600 participants in the marathon who enjoyed beautiful autumn weather with sunshine and 11-13°C. Luka Chelimo bettered the existing course record by seven seconds. The event also has Europe's only half marathon for women, a marathon for pairs (2 x 21.1 km) and a mini marathon (4.2 km). Overall, 3000 runners participated. The hot weather and high humidity put paid to the record-setting aspirations of the elite athlete field, but it did not deter Kenyan Edwin Kipyego and Ethiopian Yimer Wude from coming up with strong performances to take the overall men's and women's titles. The high-profile Ethiopian duo of defending champion Lelisa Desisa and this year's fastest athlete, Atsedu Tsegay wilted in the heat, with Desisa finishing a disappointing seventh in 1:02:50 and Atsedu Tsegay finishing out of the top 20. The men set off five minutes ahead of the women in this 8th edition of the race, held earlier than usual this year. Despite the hotter and particularly the more humid conditions the men set off at an ambitious pace, passing through 5km in 14:10. 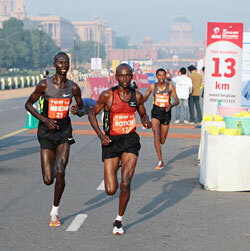 After the long straight along Rajpath away from India Gate the lead had reduced to a group of three. Little more than a kilometre later, as they approached a tight turnaround point Edwin Kipyego looked around and then left Leonard Langat and Silas Kipruto for dust. 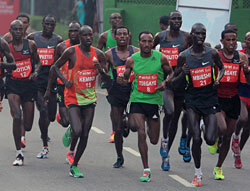 He quickly forged a lead of several seconds, but as they retraced their steps back towards India Gate at 15.5km the pace slowed and in the final kilometres slipped by close to a minute. Kipyego was never pressured and despite slowing he maintained a comfortable lead to the finish, heading a Kenyan clean sweep. 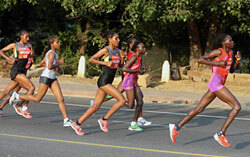 In contrast the women's race was a waiting game, as eight runners passed through the first turn point at 11km together. There were still three left in it with a kilometre to run but then Hela Kiprop was gradually tailed off. That left Yimer Wude ready to pounce as she neared the finish line outside the stadium. She did so in the last 100m, coming home a couple of seconds before the young newcomer, Waganash Amare. Top Indian performances came from 19-year old Rahul Kumar Pal, 16th overall in 1:06:12, and Sudha Singh with 1:19:34, ahead of former double winner Kavita Raut. Behind the elite races ten thousand runners completed the half marathon — before another 20,000 set off on a mass 6km "Great Delhi Run" an hour later. Geoffrey Mutai of Kenya re-established his claim to be the world's best marathoner, but only just, narrowly beating his training partner Dennis Kimetto writes Pat Butcher. Kimetto made the fastest ever debut marathon. Mutai's wind-assisted run in Boston last year, when he ran 2:03:02, was the fastest ever recorded but it was Patrick Makau's world record of 2:03:38, set in Berlin last year, which was the target. Mutai's attempt seemed doomed when they passed halfway 30 seconds behind schedule, in 62:12. Mutai's split of 14:18 between 30–35km, which killed off Jonathan Maiyo and Geoffrey Kipsang, brought him within range but the effort had cost him and the challenge had now changed to simply finishing ahead of Kimetto. Kimetto, 28, had won both the Berlin half-marathon and the Berlin 25k (in a world best) earlier this year, with second half surges; and looked so comfortable alongside Mutai that a third Berlin victory this year seemed possible. 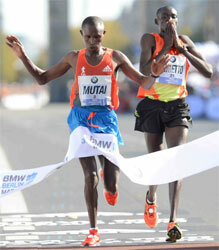 But in the final stages he failed to pressure Mutai, seeming content to follow him home a stride or two behind. Recalling Paul Tergat's 2:04:55 world record run here in 2003 it looked as if Kimetto was reluctant to challenge his celebrated mentor. Mutai's time is the fastest of the year so far. The women's race was more straightforward, and also ended in a one-two for training partners, the Ethiopians Aberu Kebede and Tirfi Tsegaye. Kebede won here in wind and rain in 2010. The contrast in conditions could not have been more marked. Both races began in bright sunshine but with a perfect temperature of 10–14°C. 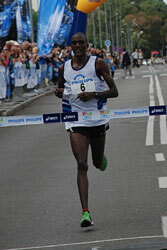 Kebede surged ahead after 30km and went on to win in a personal best by three seconds. Tsegaye also improved her best by over 20 seconds, while third-placed Olena Shurhno set a Ukrainian national record.